We welcome you to the December issue of INSIDE ATLAS.ti. This issue contains news and an overview of the training activities scheduled for the months of December, January and February. In the Best Practices with ATLAS.ti section, we share the final article in our series examining data-level work and propose a model centered on the articulation of data segmentation, writing, coding and diagramming. In the Case Studies with ATLAS.ti section, we offer you an interview with Dr. Rita Kohli, Assistant Professor at the Graduate School of Education at the University of California-Riverside. In the interview, Dr. Kohli discusses the adoption of ATLAS.ti Mac in a class she is teaching in which graduate students analyze data from a study on social racial justice. We hope these two articles give you insights into how to best utilize ATLAS.ti. With Update 1.0.37, released on November 18th 2015, ATLAS.ti Mac is now available in German and Spanish, including all program menus and instructions. To access ATLAS.ti in either of these languages, make sure your Mac is set up to German or Spanish (System Preferences > Language & Region). Please note, however, that if you change the language under System Preferences, all your applications will be in that language from that point on. You can watch a video here explaining how to do this. Additionally, we have webinars and courses offered in German and Spanish as well. Other languages will be implemented in upcoming months. To ensure long-term compatibility with current and future operating systems, full cross-platform interoperability, ATLAS.ti 8 is being rewritten from the ground up. It will feature an entirely new architecture, powerful new functionality, and further increased usability. There a many great new functions to look forward to, such as multi-level Undo, new visualization tools, streamlined integration with popular social media services and academic software packages, and much more. A great deal of effort goes into making ATLAS.ti 8 the most intuitive and user-friendly product ever. Unfortunately, ambitious innovation can sometimes take longer than initially anticipated. This is especially true for complex software like ATLAS.ti that has set the standards for professional computer-assisted data analysis time and time again. We want to make absolutely sure that you receive the mature and well-developed product you have come to know, appreciate, and rightfully expect from us. We have therefore decided to postpone the release date of ATLAS.ti 8 by a few months, into the second quarter of 2016. We hope you understand this decision and continue to look forward to the next generation of ATLAS.ti--the best ATLAS.ti so far! All licenses purchased after April 1, 2015 qualify for a FREE UPGRADE once ATLAS.ti 8 is released. Note: Support for the older Version 6 ends with the release of ATLAS.ti 8. Upgrade your older versions to ATLAS.ti 7 now and get version 8 free of charge! We would like to congratulate the two raffle winners who visited our booth at the American Public Health Association Conference held in Chicago, November 1-4. Dr. Lucia Guerra-Reyes from Indiana University-Bloomington and Dr. Shelley L. Craig from the University of Toronto, each won a single-user educational license. ATLAS.ti was proud to be a Gold Sponsor of the Southeastern Library Assessment Conference held in Atlanta, November 16-17. The conference hosted 125 attendees from all regions of the country to share and discuss practical ideas and information on advancing library assessment. ATLAS.ti in Action! Let Us Become Great Postgraduates! “Seminar Jomhebat Pascasiswazah” (“Let Us Become Great Postgraduates”) is a seminar series organized by the Malaysian Postgraduate Workshop Series (MPWS) which began in 2013. 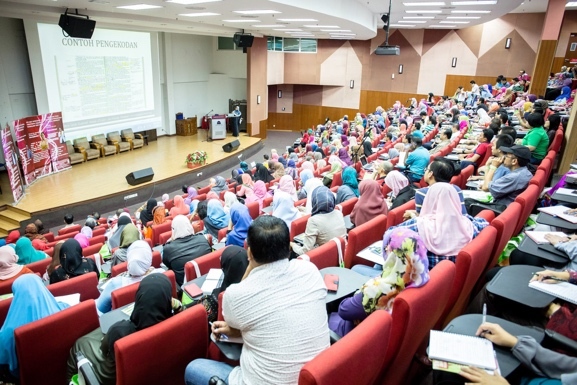 As of December 2015, 9 seminars have taken place in Malaysia, involving approximately 4,000 postgraduate researchers. The 10th seminar is scheduled for January 2016, with 500 participants expected to join. Ani Munirah Mohamad, our Manager of International Projects for Training and Partnership Development, was invited to speak at each of these seminars to introduce ATLAS.ti in the use of literature reviews and qualitative data analysis. 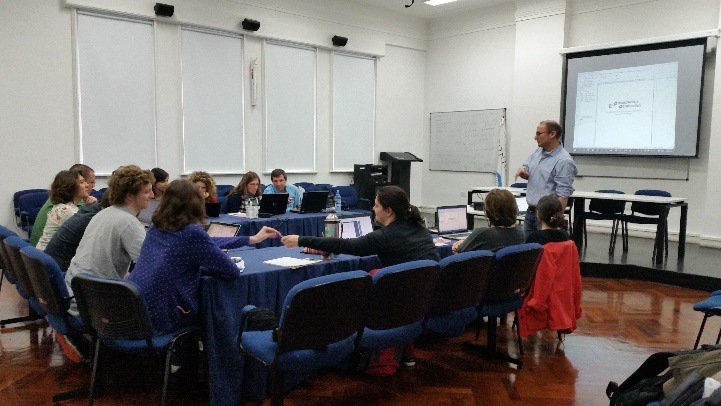 On November 12th, our sales team for Latin America gave an overview of ATLAS.ti at the Multidisciplinary Institute of History and Human Sciences (IMHICIHU, in its Spanish language acronym), one of the most important research institutes affiliated with the Argentine National Council on Scientific and Technological Research (CONICET, in its Spanish language acronym). The presentation took place at the Institute’s offices in Buenos Aires. 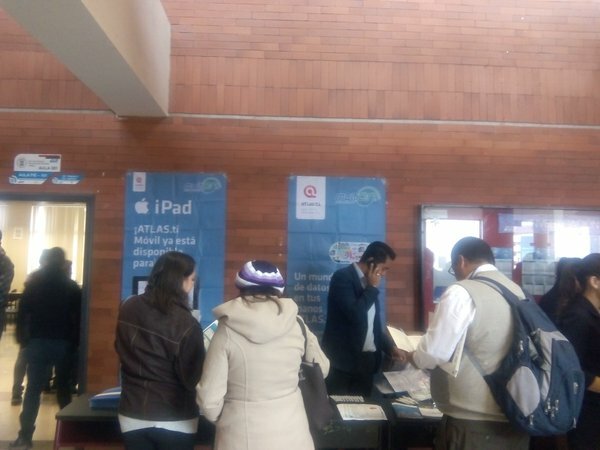 Luis Alfedo Loaiza, technical sales manager for Latin America, said the following about the presentation: "We had the opportunity to share with these researchers, many of whom are geographers, ideas about how ATLAS.ti can facilitate the analysis of their research data. They will start early next year a few studies of a qualitative nature, for which ATLAS.ti will be essential. More presentations, to other research units affiliated with CONICET, will follow this one." You may learn about IMHICIHU at www.imhicihu-conicet.gov.ar/ and about CONICET at www.conicet.gov.ar. ATLAS.ti, distributing promotional material, and explaining the software to students and experienced researchers. Dr. Gallardo gave a technical presentation on using the software in the educational technology field. Three ATLAS.ti licenses were raffled at the event. The lucky winners were Dr. Luis Marqués Molías, professor and researcher at the Faculty of Educational Sciences and Psychology, Universitat Rovira I Virgili, Tarragona, Spain; Berenice Castillejos López, doctoral candidate in education at the Universidad Veracruzana, Mexico; and Yorleny Sanchez Alvarado, expert on educational informatics in Costa Rica. Congratulations to all three researchers! The photo to the left shows Dr. Luis Marqués (middle) being congratulated by. Eliana Gallardo and Joel Cervantes from MultiON Consulting. For more information on our learning resources please contact the staff of our training center. They will be happy to assist you. In the United States and Canada, you may call us toll free at 1-866-880 0231. If calling from other countries, dial +1-541-286-4391. You can also write to us at [email protected]. You may access all of our training resources on our website by clicking here. We present overview webinars in English and Spanish and are offered at different times to meet the needs of users worldwide. The English language webinars are offered at times convenient to the EST (New York) and SGT (Singapore) time zones. The Spanish language webinars are offered at times convenient to the CEST (Madrid) and ART (Buenos Aires) time zones. Once you click on the registration link, you will be given the option of showing the webinar time best aligned with your particular time zone. To see our schedule, and to register, click here. Face to face seminars are offered in the USA, Spain and Germany. The courses introduce key functions and procedures and share strategies of data organization, coding, analysis and reporting. Our first ATLAS.ti for Mac class will be offered in Corvallis, Oregon on February 4 -6. This will be a 2 ½ day intensive workshop. To see our schedule, and to register, click here. Online workshops (synchronous instruction): All times are in Eastern time (EST) unless noted. This article closes, for now at least, a series of articles touching directly or indirectly on data-level work with ATLAS.ti. In the 2014/4 issue I discussed the versatility of quotations in ATLAS.ti. In the 2015/3 issue I discussed hyperlinking and how it expands the boundaries of data exploration. In issue 2016/6, I gave recommendations on how to make the best use of the data segmentation and coding procedures that the software provides. And in issue 2015/8, I discussed diagramming and its role in supporting data-level work. Finally, in this issue of INSIDE ATLAS.ti, I propose a model representing data-level work as the articulation of four sub-processes: data segmentation, writing, coding and diagramming. 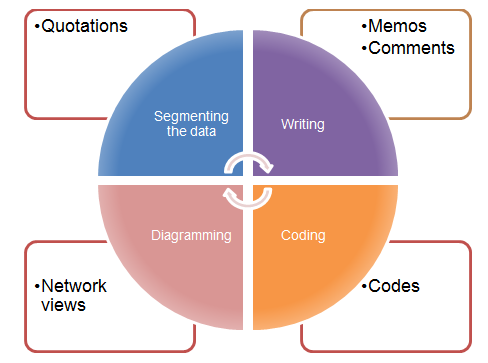 In approaching our work with ATLAS.ti by articulating segmentation, writing, coding and diagramming, we are avoiding the risk of reducing data-level work to a mere process of coding. There can be a temptation to take a coding-reductionist approach and I can think of three reasons for that. First, because software in general, and ATLAS.ti in particular, has made it very easy to attach labels to segments of the data: it is, more or less, a simple matter of dragging and dropping. Secondly, because through coding we are achieving the highly satisfying outcome of reducing into a single word or short phrase (following Saldaña 2009:53) the complexity of what a person is saying in a given segment by assigning meanings to the data (after all, qualitative data analysis has to do with interpretation and meanings). And thirdly, I believe there is a temptation to reduce data-level work to a process of coding, particularly among those experienced with other software for qualitative data analysis, because in most software, coding is the only option available to relate to the data. This involves reading and selecting segments from the source of information that calls your attention. These segments become quotations in ATLAS.ti and each quotation becomes part of a ‘database’, in which they are identified by a unique identifier. Quotations are independent objects, in the sense that they exist on their own: you may or may not code them, or at least you do not have to code them right away. As you create quotations, you make an effort to say something about them in their Comment spaces. Is there any reflection that comes to your mind as you read the segment? Is there any insight that emerges from it? Do you feel the need to further describe what the person is saying in that segment? If you feel the need to write, you do it right away. You then create an output of quotations with their comments. This can become a rich source of information to build your understanding of the data. In ATLAS.ti, you have the option to code immediately as you segment the data, as well as the option of postponing the process. As I like to say, you are not forced to commit to a given label (i.e. code) if you feel you are not ready to do so. If you decide to postpone coding and instead make good use of the option of writing comments on the quotations, those comments have the potential to illuminate your coding decisions later. Furthermore, you will arrive at coding by already having an understanding of the data, albeit preliminary. And if you decide to code as you create quotations, you should still use the quotation comment space to write your reflections on the segment. Writing is also associated with coding in the form of the code comments. You should write code comments soon after you create them. Inserting the date and the time each time you write can be useful as a way of keeping track of your evolving understanding of the code operational definitions. In ATLAS.ti 7 Windows this is facilitated by pressing Control-D, which inserts the date and time. As explained in issue 2015/8 of INSIDE ATLAS.ti, diagramming in ATLAS.ti is a rather rich process. You can represent graphically the linkages between the different objects of the project that are created as you go through the regular process of working with your documents. These linkages are known as ‘second-order links’. But you can also graphically represent your understanding of the data, by semantically linking quotations to quotations and codes to codes. These linkages are known in ATLAS.ti as ‘first-order links’. Ricardo B. Contreras is an applied anthropologist with research interests in migration, community health, and qualitative methodology. He directs the training division of ATLAS.ti Scientific Software Development GmbH and holds an adjunct research position with the Department of Anthropology at East Carolina University. He lives in Corvallis, Oregon, USA. Ricardo can be reached by email by clicking here. In this issue of INSIDE ATLAS.ti, we interview Dr. Rita Kohli, Assistant Professor in the Education, Society and Culture Department in the Graduate School of Education at the University of California, Riverside in the United States. In the interview, Dr. Kohli discusses how she will use ATLAS.ti Mac in her educational research study and train students along the way. To assist in the adoption of ATLAS.ti, our training team taught her students an introductory webinar on the basics of the software and gave recommendations on how to use the program collaboratively. Additionally, we provided a full temporary license to the group so that Dr. Khali and her students can use the software in class to its full potential. I am a professor in the Education, Society and Culture program at University of California at Riverside, and I study the racialization of teachers of color. I have a qualitative data set of questionnaires and interview transcripts of over 300 teachers collected over 5 years, and I want to merge all this data and code it. I also train doctoral and master’s students, who are trained qualitatively, but get very little hands-on training with qualitative software. I have been using ATLAS.ti for 1–2 years. The title of my study is “Cultivating Critical Teacher Leaders of Color: Navigating and Challenging the Racialized Climate of Urban Public Schools”. The objective is to examine the experiences of social justice-oriented teachers of color in urban public schools. Over the past 5 years, 354 teachers of Color from across the US have attended a professional development program geared towards cultivating their racial justice leadership development skills. 48% were Latina/o, 20% Black, 20% Asian American and Pacific Islander, and 12% of participants identified as mixed race or other. 68% of participants were novice teachers, having taught less than 5 years, and 14% were veteran teachers having taught more than 10 years. They ranged in age from early twenties to late fifties and represented the spectrum of elementary through high school. 78% of participants were women, and 22% were men. With consent, broad qualitative data from all attendees and in-depth qualitative data from 303 self-selected participants has been gathered to understand participant’s social justice commitments, racialized experiences in urban schools, and needs for professional support. Through ethnographic observations, qualitative questionnaires, semi-structured interviews, and digital storytelling, we have documented the struggles and strengths of teachers of Color. This data has been transcribed, and now we intend to code and analyze the emergent themes using grounded theory. ATLAS.ti allows me to put in multiple types of data from different years and code it collectively. We have coded it along the way in different ways, but now we are aiming to accomplish a systematic coding with a consistent set of codes. I plan to teach the students how to code, help them calibrate their expertise, and each do a part of the process. This is also a learning process for me. As an assistant professor, I have not yet leveraged student support in my research; and as someone who aims for all parts of my work to be reciprocal and mutually beneficial, this opportunity seemed like a perfect place to both teach and better organize my research.